A commercial real estate customer relationship management (CRM) tool helps agents manage leads all the way through the sales cycle to close and engage customers with ongoing communications. To evaluate commercial real estate CRMs, we looked at prices, features, usability, reporting, support, and app integrations to arrive at the six top options and best overall. Commercial real estate agents and brokers want a robust CRM software that provides strong contact management and long-term pipeline tracking with in-depth reporting to monitor sales because sales might take months to develop. Automated follow-up features and the ability to quickly customize for individual needs with accessibility on-the-go through a mobile app are top of the list of important features. With these six criteria in mind, the best overall commercial real estate CRM is Chime because it is a fully featured commercial real estate CRM aimed at providing realty offices and agencies with a complete one-stop package including contact management, marketing, lead generation and internet data exchange (IDX) website. Chime is the one-stop shop for Realtors seeking to consolidate lead generation, sales funnel tracking, customer communication and marketing into an easy-to-manage CRM. Although the price is slightly more than competitors, commercial real estate agencies will find Chime bundles contact and pipeline management with robust marketing and advertising features, including an editable IDX website without complicating the user experience. Chime is best for growing midsized offices. 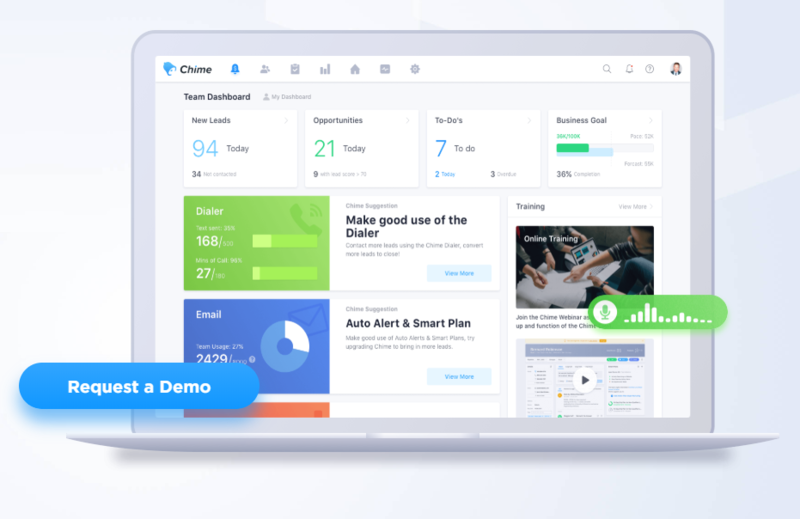 Chime ranges from $29 to $69 for features like an IDX website, fully functional blog and power dialer to make automated calls or leave bulk voicemails. Chime nurtures leads through the funnel and automates the sales process all the way through the pipeline to connect agents to potential buyers at a deeper level. The Starter plan for Chime is close to other commercial real estate CRMs in price and features. With a CRM to nurture leads, bulk email messages to make sure communication stays strong and automation to keep from repeating the same manual steps over and over. Chime Starter plan is a good place to begin with real estate CRMs if you are not familiar with the layout or have a medium-sized agency that will grow over time. Chime is feature-heavy like Propertybase, so the ideal user is a midsized company that is expanding or planning remote offices. The Professional plan takes a step up for providing a missing piece vital to the real estate industry: an IDX website with sales tracking and lead routing. The reality is that a good commercial real estate CRM must increase sales through lead generation and lead nurturing. Unlike Freshsales or Insightly, the Professional tier hits all of these hot spots for a commercial real estate CRM with one solution. The Chime Professional plan is aimed at medium and larger agencies due to the increase in price and features. As a one-stop solution geared toward the real estate industry, Chime provides a solution from an IDX website with robust lead capture form to backend behavior analysis and marketing tools to keep agents engaged with leads. The Chime Accelerator plan is directed toward large agencies that need to understand performance against sales. Chime reporting offers the ability to see data like closings, revenue and volume in sales. The Accelerator plan has an easy-to-read dashboard combines the simplicity of a quick daily overview with the capability to deep dive into the data for critical decisions that rivals Freshsales and Insightly. There is an Enterprise plan that is a custom solution for large-scale commercial real estate operations that includes a design and development team, open house live streaming, drone footage and 24/7 phone support. The pricing varies according to team needs and features. Chime reporting dashboard (image via website). At the Professional plan, email customer support is combined with an extensive database of videos and online self-support options. As the interface is extremely user-friendly, the likelihood of needing customer service is low. Increasing to the Accelerator plan means additional phone support from 8 a.m. to 5 p.m. Pacific time during the week due to the additional features. Chime is missing a more cost-effective or free subscription level for basic CRM services such as those offered by Freshsales, Insightly or Apptivo. Without a free trial, the ability to overcome objections requires an investment, but a sales representative might be willing to give you limited access to the CRM after the demo upon request. Positive reviews note that Chime is built for real estate professionals with an easy-to-use interface without a learning curve to get started. Some negative reviews indicated that email only customer service can be a problem, so you might want to consider Apptivo, Realvolve or Freshsales if on-demand customer support is important. Check out our Chime review page for more details. Learn more about Chime on its website. Ask for the free demo to get a real feel for the advanced features of Chime and how it might work for your commercial real estate agency. Freshsales is a non-real estate-specific CRM that is highly customizable with robust features. With its unique at-a-glance layout, teams are able to address communications tasks quickly and move the contact through the pipeline toward a sale without extra clicks or steps. Freshsales CRM delivers customized lead tracking with time-saving email campaigns, built-in phone app and advanced reporting at an affordable cost. Freshsales includes a free plan for unlimited users with the basics of a commercial real estate CRM with a slightly higher price range of $19-$65 that can easily be decreased with an annual subscription. Unlike Chime, Freshsales offers a full 30-day free trial to test the features with an informative demo. Blossom users are able to visually track sales key performance indicators (KPIs) and monitor sales quotas. The addition of email campaigns and mobile app make the Blossom tier worth the upgrade. The Blossom tier is just right for smaller offices that want a starter commercial real estate CRM without an expensive investment. The ability to stay connected to potential buyers and nurture the leads through the pipeline is vital to conversion. There are add-ons that make Freshsales scalable without adding complexity, which is rare for a commercial real estate CRM. If the ability to customize your sales reports and your CRM is vital to your success, then the Garden tier of Freshsales is right for you. Like Chime and Propertybase, the addition of territory lead assignment in Freshsales means that you can create a CRM and a workflow that works for your commercial real estate office at a lower cost. The Garden tier from Freshsales, like Insightly, is right for offices with multiple agents or growing commercial real estate agencies. The ability to follow leads through the pipeline and customize sales reporting will justify the slightly higher price. Assigning leads means that you have control over every stage of your office workflow. At the Estate tier level, remote teams save time on tasks and tracking leads through the pipeline. 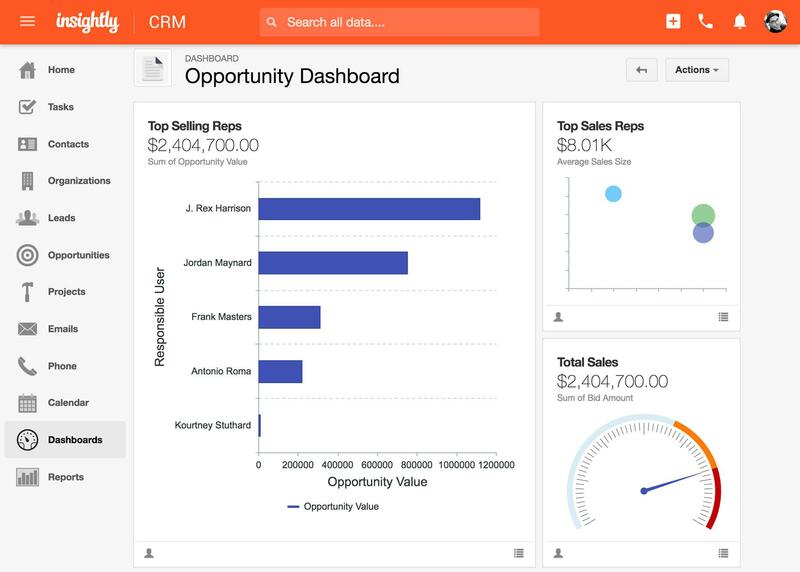 An advanced reporting dashboard and the ability to see where leads come from make all of the difference. For brokers or managers, the ability to see how a lead reached your office, how an agent handles that lead and how that lead increases good decisions about marketing and sales performance. The Estate tier is right for an agency that needs strong pipeline lead management and robust reporting. At this level, Freshsales does a great job at creating harmony between easy-to-use daily features like built-in phone or contact management through an app and ongoing weekly tasks like bulk emails or sales reporting. Commercial real estate companies with a larger staff of agents or multiple offices will appreciate the Forest tier. The annual contract of $79 per user, per month gives high-level users access to a data center and whitelisted internet protocol (IP) addresses. 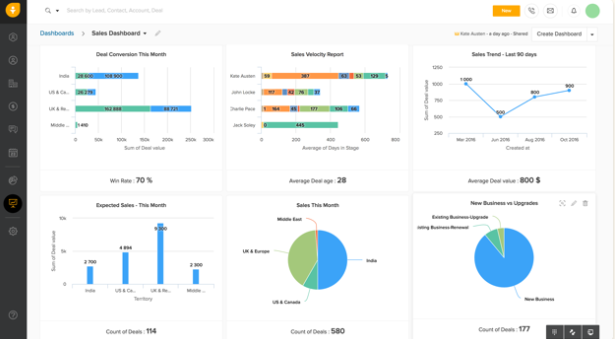 Freshsales sales reporting dashboard (image via website). Like Apptivo and Realvolve, customer support is available for Freshsales. Although the ease of use and robust online self-support library makes the likelihood of support issues low, all plans —even the free accounts — come with 24/5 phone and email support to resolve issues. If customer support is important to you, then Freshsales will be a good option. Freshsales is not an out-of-the-box solution. Customization is required to make sure that lead monitoring is on track. With any suite product, the customization can get out of hand and cause the entire system to slow down. Like Zoho, Freshsales is only a part of a whole suite of products that might seem complex to new commercial real estate CRM users. Some users reported that the ability to customize Freshsales was an issue and noted that there was a significant slow down in the syncing abilities. Other reviewers noted that customer service combined with ease of use were winners. View our Freshsales CRM review page for more details. Visit Freshsales for a 30-day free trial will give you the ability to test out the features and see if the contact management and sales reporting are a good fit for your commercial real estate company. Apptivo is a minimal version of a commercial real estate CRM that manages customer engagement and nurtures leads through the sales process. With a focus on task management and ease of movement through the pipeline, Apptivo has streamlined sales and reporting modules at a more affordable price point. Apptivo is right for small agencies looking for a basic CRM with a low learning curve. Apptivo is $10 to $25 per month, per user with a price break for an annual subscription. Like Freshsales, there is a Starter plan that is free for three users who only need a basic CRM. Even at the Ultimate level, Apptivo comes in as the best value of all of the commercial real estate software. Even at the free level, sales reporting is a vital part of the Apptivo platform. Like Freshsales, the primary reasons to move up to the paid plan include sales reporting, marketing automation and multiple pipeline tracking. The basic Starter plan is a way to get your feet wet and learn the working of a commercial real estate CRM. The Starter plan is ideal for real estate agents that need a place to begin with a real estate CRM or are inexperienced with online solutions. If you have an offline agency seeking to move online or a smaller office that needs a bare-bones solution, then the free Starter plan is probably the right choice. Starting at the Premium level, the user is able to move from standard sales reports to add features like the ability to schedule reports, create performance reports to compare sales, create win/loss reports and the ability to customize reports using Kanban View similar in reporting to Insightly. At the Premium level, Apptivo connects to interfaces to create a complete commercial real estate software solution. The Premium plan is for agents who have used or are using a commercial real estate CRM already. Stepping up into the Premium plan will help Realtors who want to plug-in their favorite third-party solution to get a big picture of their lead generation and sales funnel all in one place with robust sale reporting for guidance. The Ultimate plan includes territory management, more file storage space, security features, expanded customer support and larger mass email sends. These higher-level features are not great improvements in functionality unless you need to reach more people on a regular basis with communications, mass emails and shared files. The Apptivo Ultimate Plan is right for large agencies with multiple agents who need to stay connected to a bigger client base. The extra space for file storage and bulk emails will come in handy for those real estate companies with a multitude of agents. There is an Enterprise plan that includes more users, white labeling, customization, customer support and dedicated Apptivo team members to help with migration. Pricing depends on features and number of users. 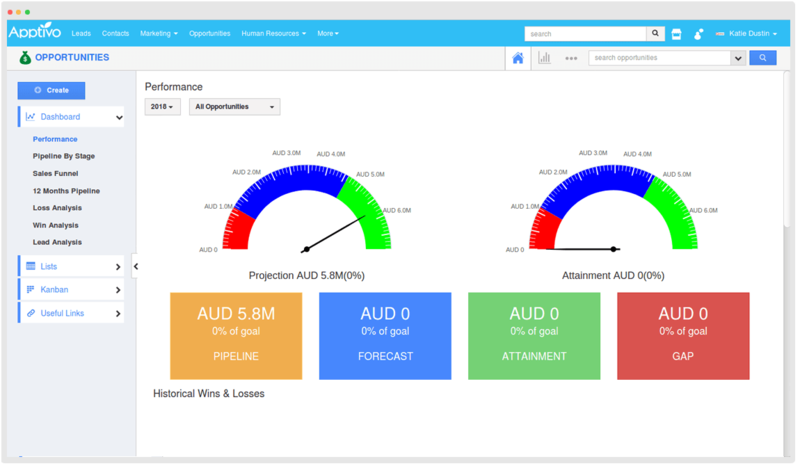 Apptivo Performance dashboard (image via website). Apptivo hits a home run with customer support. The free module has email support during business hours during the week and 24/7 chat support to make sure easy or complex questions are answered efficiently. Like Freshsales and Realvolve, the paid package adds in phone support and enhanced email customer support hours with the option for chat support. In this category of commercial real estate CRMs, Apptivo is missing some of the real estate specific features like an IDX website or full marketing suite. If you already have these solutions and only need a CRM, then Apptivo is a good choice. If an all-in-one real estate solution is important to you, then you might want to look at Chime or Propertybase. Many reviewers note that Apptivo is a great alternative to the heavy feeling of Salesforce. With an easy to customize platform, Apptivo is a lightweight version of a CRM with heavyweight features. Others have noted that Apptivo is not easy to expand or scale as a business grows. Read our Apptivo review page for more details. Learn more about Apptivo on its website, where you can sign up for its free Starter Plan and 30-day free trial to test all of the features and find out if Apptivo is right for your commercial real estate company. Insightly is very customizable CRM allowing users to create their ideal workflow and lead pipeline. Insightly focuses on using project management tools to track leads through the sales funnel and a pipeline to drive sales. Insightly is just right for remote agents or on-the-go Realtors that need to monitor tasks and turn leads into transactions. Insightly has a free plan for two users for their basic CRM. The first paid plan starts at $35 per month and increases to $99 per month but can match Chime easily by using an annual subscription price break. The free 14-day trial will help you find out if Insightly is right for you. Even with the free package, Insightly brings the benefits of project management to life for commercial real estate agents. The Plus tier combines customized reporting with their easy-to-use app to get agents to finish tasks and address issues from anywhere. Insightly does a great job of putting all the information you need in one place. Insightly Plus is built for those who love to use project management as a part of their sales cycle. The Insightly Plus tier is full of features that help busy agents move from one task to another in the workflow while still keeping an eye on sales reports. Field-based and remote team members will use the mobile CRM to view data from their desk or dashing to an appointment. With the Professional tier, Insightly takes project management to a whole new level. 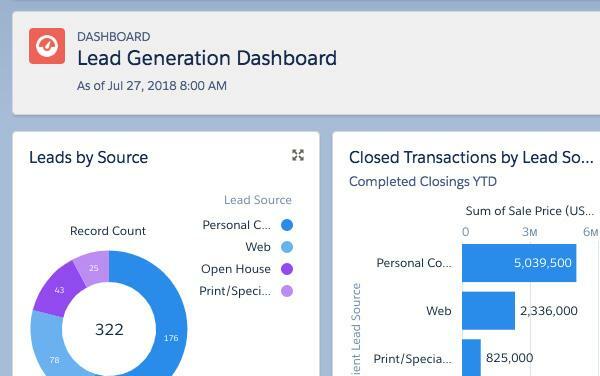 The inclusion of custom dashboards to see what is important and workflow automation to streamline tasks means that agents are finally able to see the full picture of the sales funnel. Insightly Professional tier shows agents task lists, pending deals and progress through the pipeline. The robust project management workflow module is ideal for medium to larger offices with multiple agents. Like Freshsales, remote teams and agents who are always out-of-the-office in the field will especially appreciate the ability to complete task on-the-go and advanced customization to see what matter to them. The ability to configure the layout of your screen is essential to see what should be done now and finding the tasks you need quickly. The Enterprise tier of Insightly focuses on making a commercial real estate CRM more usable and function for each agent with dynamic screen layouts and an easy single sign-on to access everything at once. For office managers, administrators or members of an executive team, the Enterprise tier is essential because it allows full-featured integration with Slack for communication, Dropbox for document storage and MailChimp for email marketing. Everything you need to run an office with robust reporting and sales performance numbers will be right at your fingertips. Insightly Opportunity Dashboard (image via the Insightly website). Insightly mainly offers email only customer support combined with online videos and articles. Basic email support is available starting at the Plus package and priority support begins at the Professional package. Phone and email support response time, usually within a few hours, is only available with the purchase of a customer support package. Insightly is missing high-level customer support without the excessive price. The addition of a support package starting at $1,500 per year might be a deal breaker for many small or medium-sized companies. Because of the stiffer learning curve for Insightly, other options like Apptivo, Freshsales or Realvolve might be a better choice if customer service is important for your commercial real estate business. Reviewers often reported that Insightly seemed overwhelming or more complex than necessary to complete simple tasks. Often, people reported that it was hard to get customer service to respond to issues. Have a look at our Insightly CRM reviews to see more details. Check out the Insightly website and take advantage of its free plan for basic users. A 14-day free trial of its paid plans should allow all the time needed to make sure that this commercial real estate software fits into your office to streamline workflow between users. Propertybase is a more expensive option for larger commercial real estate companies familiar with Salesforce that want the convenience of an all-in-one marketing, CRM and IDX website portal that enhances lead generation. As a turnkey commercial real estate CRM software built on Salesforce, Propertybase ticks all of the boxes for lead management for Salesforce users. Propertybase is for larger companies that want advanced functionality in a CRM even at a higher price. Starting at $79 per user, per month, there is a minimum of four seats. Unlike Chime or Freshsales, there is not a price break as Propertybase bills yearly, so taking advantage of the 14-day free trial is vital. The Small Team and Company tiers both have the ability to create drip emails, document management, lead notification with routing and create suggestions for similar properties for the search commonly known as “deal matchmaking.” The difference between the two tiers is the minimum users needed to participate at that level. For teams of three people who pay yearly, the Smart team tier will cost $3,564. Teams of four in the Company plan will pay $3,792 per year for the same features. If your team is using Salesforce as a base, then you will probably want to examine Propertybase as a turnkey solution for your commercial real estate CRM. The Enterprise tier of Propertybase is equipped with features built for larger real offices with multiple offices like franchise management modules, commission portals for Realtors, unlimited media storage for easy access to videos and robust financials. The Enterprise level folds the needs of real estate office into the features of Propertybase. The top-level features of the Enterprise tier mean that large agencies can manage their franchise investment, track sales and monitor financials at a deeper level to help make decisions about expenditures for sales and marketing. The Enterprise tier turns a commercial real estate CRM into a complete tracking system. Propertybase customer support is mainly available through the online library and support ticket submission. Support cases can take up to 48 hours to answer. There is enhanced customer support that includes callbacks and live screen contact with a representative available to premier subscribers. Propertybase is a higher cost option for an all-inclusive solution for real estate agents. When compared to Chime for a commercial real estate CRM, Propertybase is higher due to the minimum user restriction and the annual billing contract. Therefore, if you need a solution for fewer users or that is more affordable, then Freshsales might be a better option. Most users noted a high amount of satisfaction with Propertybase as an all-in-one real estate focused solution. Some users noted that the price was on the high side and lack of customer service caused problems in everyday use. 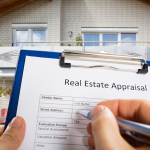 Check out our Propertybase CRM reviews for more details. Visit the Propertybase website for a 14-day free trial and an extensive demo to help you make sure that Propertybase is a good fit before entering into the yearly contract. Realvolve uses the basics as the building blocks for an easy to use CRM and delivers some benefits through integration without adding complexity or cost. Realvolve is unique when it comes to finding a CRM in that it focuses on the basic needs of commercial real estate companies without the bells and whistles. RealVolve is ideal for Realtors that only need to track and nurture leads through the sales process without cumbersome “added” features. The base price for the Realvolve Pro plan starts at $59 per month for one user and one assistant, which is higher than other commercial real estate CRMs. There is a price break at all tiers with an annual contract and the 14-day free time gives you time to examine the interface and the features. Realvolve focuses on creating an easier experience by removing clunky features and stumbling blocks that cause extra clicks for task completion. Built around email and web features familiar to the user, Realvolve removes unnecessary modules and decreases the complication of following a lead through the pipeline. Customizing email templates gives real estate agents the power to set up and distribute information to buyers in groups quickly. Knowing where leads and referrals come from can help you understand your marketing expenditures and decrease advertising expenses. 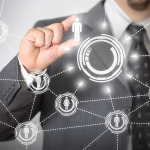 Realvolve focuses on keeping you connected with potential buyers across online platforms. The ability to reach out and share information through emails, texts and social media keeps buyers engaged. Closing transactions mean commissions for real estate agents, so the ability to track net commissions and share details of transactions can provide extra incentive each week. 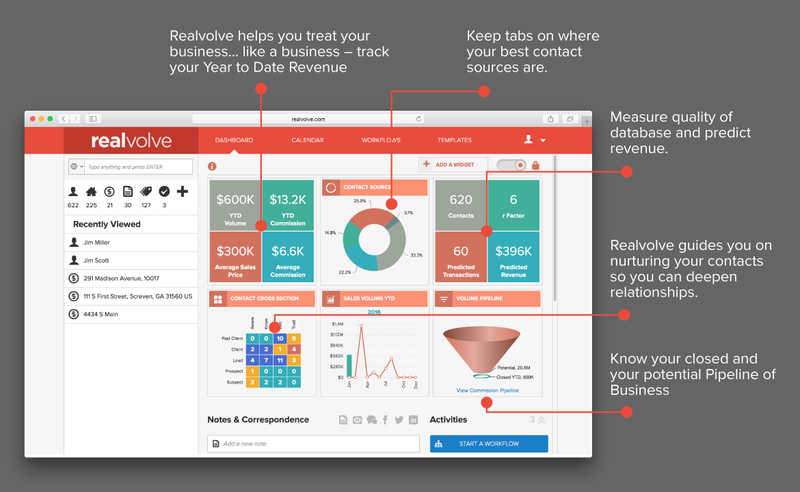 Realvolve dashboard (image via website). The reporting features are displayed as widgets on the dashboard as well as printable into hard copy. You can see such data as sales volume, average commission, number of buyer and seller closed deals, year-to-date (YTD) commissions and YTD revenue. While Freshsales and Chime have more detailed sales reporting, Realvolve reporting is a basic high-level overview of the results of your sales funnel. Realvolve offers only live chat and support tickets for customer issues. You can contact them via live chat between 9 a.m. and 9 p.m. Eastern time to get an immediate response. After hours, you can send them a support ticket via the website, which is answered fairly quickly. Realvolve offers some good third-party integration with platforms like Zapier, EverNote, G Suite and email for streamlining workflow and connecting to clients. The surprise is that Realvolve recognizes that necessity of social media connections and short message service (SMS) texting for the platform to further the goals of the agent. 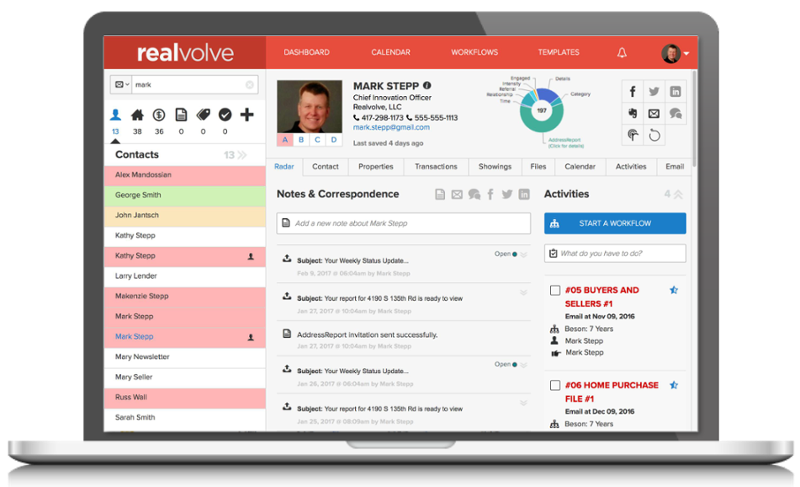 Realvolve is primarily missing the sleek interface that most users expect from a commercial real estate CRM. In a way, what is missing is exactly what makes it a powerful, easy tool for real estate agents that want to get work done without the complexity of extra modules and painful price points. Reviewers seem to love the ease of use and streamlined workflows of Realvolve. Some people noted that it does take time to set Realvolve up for your particular office and operation, but the time investment pays off. See our Realvolve CRM reviews to see specifics from other users. Visit Realvolve to find out more about their commercial real estate CRM. With a free 14-day trial, you can test out all of the features to decide if it is right for your commercial real estate company. A truly useful commercial real estate CRM merges ease of use with robust features to track leads through the pipeline and keep up engagement with drip communications throughout the sales funnel. This comparison yielded the above six best commercial real estate CRMs for companies seeking an affordable solution for contact tracking and sales funnel management. Chime finished at the top of the list of the best commercial real estate CRMs because of the all-inclusive nature of the service offerings, even at a slightly higher price point. Chime is a terrific choice for growing commercial real estate offices that seek a turnkey solution including IDX website, marketing and CRM all in one place. Learn more about Chime with a free demo.